Olympian Kat Driscoll believes the British team can end their 13 year wait for an individual medal at this week's World Trampolining Championships. Driscoll, 28, helped claim team gold at the 2013 worlds in Bulgaria, but GB's last individual honour was Claire Wright's bronze in 2001. The four-strong GB squad begin their campaign in Daytona, USA, on Friday. "All of the British girls are more than capable of winning a medal," Driscoll told BBC Sport. She will be joined by British champions Bryony Page and Lewis Bartlett with European team gold medallist Pamela Clark completing the line-up. Driscoll is drawing confidence from her impressive performance at this year's European championships where she claimed individual silver. "I'd always done well in the team and synchro events, but never really excelled individually," said the former world number one. "I was disappointed not to win - after leading in the preliminaries - but to still come away with a medal was amazing and that's something I want to take into the worlds." 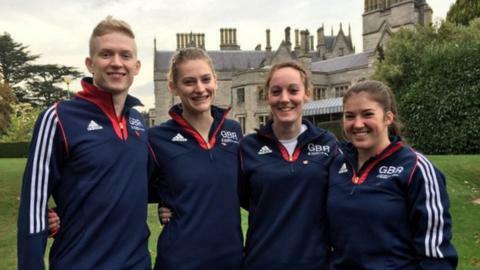 Although the squad have previously competed in the team and synchro competitions, they will focus on the individual events in the USA - as they are the only ones included in the Rio 2016 Olympics. "London  was a great platform for us all to move forward and we showed the strength as a team by winning the world title last year," continued Driscoll. "To be able to pick up a world medal now would be another real statement ahead of Rio, that Great Britain is coming." In addition to the Olympic trampolining events, British gymnasts from the non-Olympic 'tumbling' and 'Double-Mini Trampoline' events will also be competing in the USA. Reigning senior World Champion Kristof Willerton, European silver medallist Greg Townley, James Booth and Steven Gilmore will compete in the men's tumbling events. European champion Lucie Colebeck, 2013 World Games silver medallist Rachel Letsche and Heather Cowell are in the women's line-up. The Double-mini Trampoline teams will consist of Nicole Short and Georgia Downing, as well as Nathaniel Scott, Peter Cracknell and Michael Scott-Beaulieu.